Wonderful-smelling spray to use all around your living space. Aromatherapy has hundreds of benefits. The most common are that it can help relieve stress, lift depression, and improve your mood. It's a highly customizable regimen that has its place in every room of the house, especially private rooms and the highest-traffic rooms. This particular tutorial will teach you how to make your own herbal/floral water. You can choose to use just one herb, or a variety of herbs combined. Experiment first by using one herb at a time, then mixing smaller quantities of different waters together until you find one you'd like to make in a larger quantity. Start by bringing your cup of water to a smooth boil. For the best, most even boil, heat your water in a tea kettle or in a pan over your stovetop. Add 2 tablespoons of crushed, dried herbs or flowers to a large tea infuser. Use a high-quality steel one to avoid imparting a metal scent to your water. Pour the boiling water over the infuser full of herbs. Allow to steep for at least 10 minutes. You can steep your herbs for up to 30 minutes because unlike teas, herbs and flowers do not oversteep. 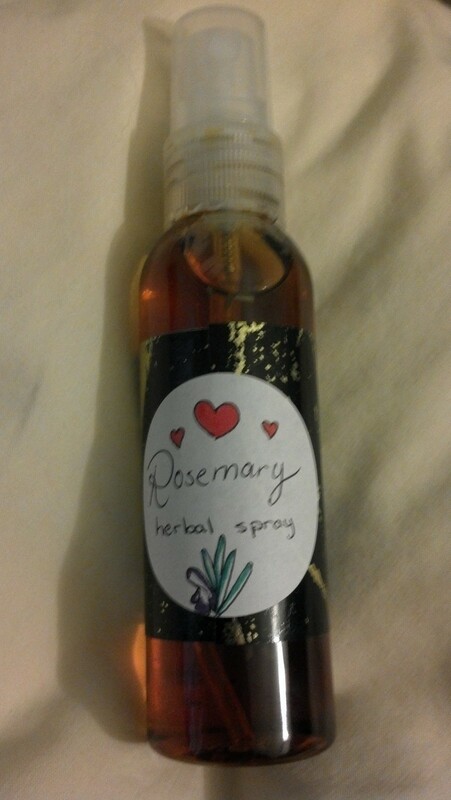 When your herbal water has steeped sufficiently and has begun to cool, pour it into a clean, empty spray bottle. Add the teaspoon of baking soda and shake the bottle until it has dissolved completely. Baking soda will help the water keep its fragrance, and it will also help to deodorize any carpet or furniture that you spray. Using a dark-colored spray bottle will also help increase the shelf life of your spray. Be sure to keep it stored in a dark, cool place. Now it's time to take your spray for a spin. If you're pleased with the way it smells, put the cap on your spray bottle and spray it on carpets, drapes, and furniture. If you think the smell is too weak, consider adding essential oils to the water and shake well before every time you use it. Alternately, you can make a more potent brew by reheating the water to boiling and steeping a fresh heap of herbs in it. could you use other things than herbs to give it a more perfumey scent? Yes. You can use flower petals and dried fruit peels. I sprayed mine all over the living room. I'd suggest more steeping if you want a pretty strong scent. Mine's very light, but really pleasant that way.